Brigid O’Gorman is a junior at Connecticut College in New London, CT, majoring in cellular and molecular biology as a pre-medical student. 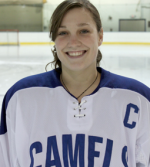 She is captain of the women’s hockey team, a registered emergency medical technician, and winner of a $10,000 Davis Projects for Peace grant for her project to implement electronic medical records in rural Uganda. Connecticut College is contributing $3,000 as well. 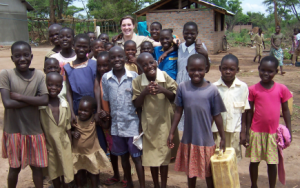 While traveling to the airport with a group of Connecticut College students leaving on a medical mission to an orphanage in Kaberamaido, Uganda in the spring of 2009, a drunk driver struck the van in which they were riding, injuring several of the students and killing the trip’s organizer, who would have graduated in 2010, and in whose memory the clinic in Uganda has been renamed to the Elizabeth Durante Medical Clinic. I’m from Eden, New York, just outside of Buffalo. I live on a farm. It’s really fun, I love it. My dad’s a physician, an internist. My mother has her own flower business. I went to Nichols School in Buffalo for high school. It’s a private school. I was captain of the women’s hockey team there. I also played soccer and lacrosse there. Then I came to Connecticut College and I’ve been playing hockey here since freshman year. I’m now the captain of the team. 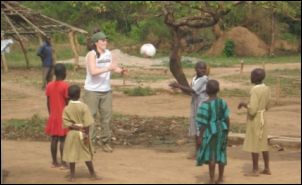 I played lacrosse my freshman year, but decided not to do that any more because it was during spring break and I’d rather go to Uganda during my spring break. That was my option and that’s how I got into this whole Africa thing. Going to Africa has been something I’ve wanted to do since I realized I wanted to be a doctor. I’d always wanted to travel. I’d been to China and Africa was the next place on my list to go. I absolutely love it. I found out about this opportunity to go in the fall of 2008 through my school. There was a pre-health club meeting which I’m a member of. So I went to this meeting and a couple of girls were up there talking about how they wanted to take a group to Uganda on medical mission. That was like right down my alley. I went to this other meeting and signed up for it and that’s when I got to go last year. What was it that intrigued you about Uganda? Nothing in particular. I would have been satisfied to go anywhere in Africa, quite honestly. 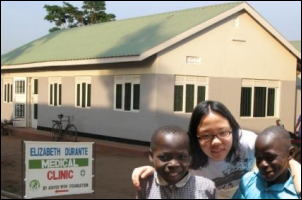 Uganda is where these two kids started that group to go and they had been there the year before with Asayo’s Wish Foundation. They’re out of Salt Lake City, Utah. They have an orphanage in Uganda. I ended up going by myself, but what we did last year was go with Asayo’s Wish Foundation. I worked at a medical clinic in this town where the orphanage was. I wasn’t so much interested in children, although that was really a fun experience for me. I worked with a doctor, mainly, and I kind of played around with the kids. What were your impressions from a medical or public health standpoint? I got to take blood samples and got to look at the malaria parasite under a microscope. It wasn’t powered or anything, but it just had a mirror that caught the sun so it would shoot light up through so you could see it. Obviously technology is extremely lacking. They only had one of those in this medical clinic. The doctor had one nurse that helped him out. The way it works over there in these clinics is that the doctor just kind of showed up whenever he felt like coming to work, really. He would just, like, show up and people would hear that, “Oh, the doctor’s in his office, so we can go now.” They don’t set up appointments or anything — people just show up and line up outside the office. They just kind of sit outside on the ground, first come, first served. You get there early and keep it and you get an appointment. He and myself, we got to give them all sorts of medication. I brought over a lot of antibiotics with me that were donated by my father’s office here, so we got to hand out antibiotics. Most of the people had malaria, so we’d have to hand out malaria medication. There was a lot of STDs, so we had to hand out antibiotics for that. From a healthcare standpoint, they really need medicine. There’s nothing. There’s practically nothing. I’d say the bulk of the supplies they had I brought over with me. That was kind of special just to donate all those things to the people. Tell me about the grant you got to set up electronic medical records and how you got the idea. I got the idea because while I was there last spring, whenever the doctor had a patient come in, he would write down their symptoms and ask them questions like, what are you here for? He’d write down their symptoms and what he thought they had and what he was going to prescribe them in this little blue book. It’s just like an exam book that I take my exams in here, so I was like, wow, that’s really weird that I’m seeing these thousands of miles away from my college. It was used to keep their health records in. I thought that was a little perplexing, to say the least. After he’d fill it out, he’d give it right back to them and say, hold on to it. It would have their past visits to the doctor in it so he could go back and look and see what they last came in for and if it’s any pattern or relation or anything. A lot of the patients didn’t have these, because the doctor gives it back to them, so most of them lose them because they don’t realize how important these things are. They have no concept of staying healthy or this whole medical record system. They weren’t concerned about holding out to this blue book, so it was often that they didn’t have one, which was difficult to try and figure out if this person had a previous medical condition that you didn’t know about. When we were there, I also worked in the orphanage with about 180 children who didn’t have any medical records either. I kind of built on that foundation of the blue book they were using. I bought blue books there and we started health records for all these children. We wrote down their name and age. A lot of them didn’t know their age because they were orphans, so we’d have estimate their age from their weight or their height. We started that last year and I’m really hoping that it’s continued and people are doing checkups on them and doctor’s visits and things like that. This was what got me to thinking that they need a more reliable system, I would say. I mean, how are these orphans going to hold on to these little blue books when adults can’t? I thought, I’m a college student and I know about computers, which isn’t that hard to figure out. It’s not that hard to install them. I’ve done it before and it’s simple. I was planning on using the electronic medical software, hopefully from MEDENT. I haven’t purchased it yet. I know one of the company’s branches is in based out of Buffalo, so I was hoping to talk to them and hopefully get some donations of this system for my computers. One of my dad’s doctor friends has this MEDENT software at his office and I’m going to go see it. I’ve looked at it online and it’s pretty much what I need. I actually need a simpler form of it because I don’t need X-ray scans, I don’t need all the pictures and MRIs they can set up on these systems. I just need patient assessment, patient information, history, just very general, simple things. I’m going to try to work with them and get that going. I haven’t bought my computers yet, but I’m going to get four of them from Dell. I’ve already talked to them about it. I’m going to have them sent to my house soon and get the medical software installed at my house and set up this whole little system at my house so that when I get to Uganda, I won’t have to worry if something goes wrong with the computers. There isn’t really going to be anyone there to help me, so I’m just going to try to set it up prior to getting there. I know they have gasoline over there and can power generators. The electricity they have isn’t a lot. They only had one light bulb that actually worked and they ran it on a gas generator, so I figured that would be easy to power the computers. I’d just get a bunch of generators and I could help them power more and have more electricity at this place. That was my original idea. Then I was talking with one of my advisors here from school and she mentioned why didn’t I think about solar panels? I decided to look into the solar panel idea. I learned a lot about them. It sounds a little complicated, but it’s really pretty interesting. It’s not that difficult. I’ve located a business in Kampala, which is the capital city of Uganda, that sells solar panels and will install them for you. That’s where I’m going to be purchasing my solar panels and I’ll be doing that when I get there. It’s an eight-hour drive from where they are to where I’m going to be, where it’s extremely rural and there isn’t anything around. They’re going to drive them out there and install them for me, which will be great. I hired an electrician already to make sure that the electricity works. I’ve hired a computer technician. These are all native Ugandans, so we’ll see what I get. I’m pretty excited about that. What will your system do? I’ll have two facilities. One is at this medical center and another is at the local hospital, which is turning out to be a little difficult because this hospital is a government-run hospital and it’s actually from what I’ve heard and found out from people who are working there right now has ended up being corrupt and things are getting stolen, so I’m not sure how much I want to invest in that hospital, but I’m going to give it a try. 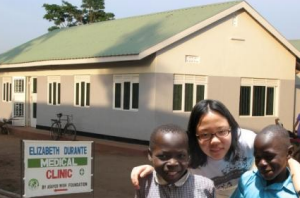 My primary facility for this will be this medical center that is on the orphanage property. My plan is to have two computers, one in the patient room when a patient comes in. That will be there for patient visits. The second one will be in another office in the building. That will be for collecting blue books and transferring information from these blue books into the computers. I’m going to have a system where the information is transferred from these blue books to computers, and at the same time, the doctor will be doing his normal patient care. Instead of writing things down in their blue book, he’ll be putting it into the computers, so we’ll probably be tackling two things at once. I’m bringing printers because they don’t have any form of identification over there. That got me thinking because when I got my driver’s license, you finally have that little card that identifies you. It’s just a huge symbol of who you are to my mind. To make ID cards for these people over there, I really think would have a huge impact on them. I think they would absolutely love it. We’re going to have webcams to take pictures of each patient, so their information will be in the computer along with their picture so that you can recognize them. The picture and their name will be printed on this card and we’ll laminate it and give it to them. It will all be on the computer, so if they lose it, we can print them out another one. I was also thinking about making ID numbers for each name, just so that you can enter the number or name either way so the person’s medical files will pop right up. They hand you the card, you type in their number, and you have their medical file immediately sitting in front of you. You know their whole history and you know everything that’s been wrong with them up until now. That’s my goal for those cards — just to give them the thrill of having an identity and something physical to hold on to that says they’re here, they belong here. And also to expedite their gaining of their medical files that are in the computers. They’re going to be powered by solar energy, so after the initial purchase, so it won’t cost very much, hopefully nothing at all except maybe for maintenance which shouldn’t be too bad because solar panels nowadays are pretty durable. Part of my proposal, so that the system doesn’t degrade after I leave, is to start training some of the older children of the orphanage. There’s 18- and 20-year-olds living there, so my idea was to start training them on these computers and have a different type of vocational program where I would teach them how to input the information and teach them all about computers and what I’m doing so that they are that much further ahead. In a country like this, especially in this rural area, having the knowledge to work on computers would be huge for children there. Maybe someday if they wanted to leave that area, they could go and work for the government in Kampala; they could work wherever they want. That’s another piece of my project that I’m really excited about, just to help boost kids up and give them something to do with their lives. If someone wanted to help you with this project, what else do you need? I actually haven’t yet bought anything for it. I’ve been trying to concentrate on my school work right now. I’m a junior and I’m taking organic chemistry and it’s not easy, so I’ve been really focusing on my studies right now. I’m not leaving until July 1, so I have a lot of time once school’s over to start getting into it. I’m going to be needing four computers, two printers, a laminating machine, the solar panels that I’ve already purchased over in Kampala, and any kind of electronic medical record software that I can install on the computers. I’m focusing on MEDENT because my dad’s friend has used it, he’s accustomed to it, and his office likes it, so that way I can get a feel for it from him. I kind of need everything, but I do have the money for it, so that was really cool and I’m so happy to have this grant. Other than the fact that the patient carries the record in Uganda, we’re not all that advanced in the US, where your record is in a manila folder on some shelf someplace and people debating whether it should be in a computer instead. What are your thoughts about that? It’s a debate and there’s a lot of sides to it. I’ve discussed this with my dad because his office runs on those manila folders. They have the hard copy paper and that’s what their patient files are. He has files full of them. The doctors I go to personally have the electronic medical record software. I work in the ER and that’s what all their systems run on. It’s definitely faster and more efficient, but you also lose the personal aspect of sitting down with the doctor and having them actually writing things in front of you and taking those notes. It is a difficult debate, but I would have to side with the electronic medical software because it’s permanent and it keeps things safe. The personal aspect of it can be accomplished by doctors actually learning the computer rather than just dishing off information to a nurse or something and having them try to interpret their writing and put it in. If it becomes more familiar to people, it will be really good, but you can’t lose that personal connection between the patient and the doctor. That makes people comfortable and that’s why we’re doctors. You’ve made time for a rigorous academic curriculum, hockey, and volunteer work. Are the people you know equally involved or are you different? I never actually thought about that before this whole story started coming out. Recently I was nominated for the Hockey Humanitarian Award, which is given to the best hockey humanitarian student, male or female, from any Division I, II, or III college. That’s what got me thinking that I guess I’m not really normal. I really thought, don’t other people do these things? I really didn’t think it was that uncommon, but apparently it is. I just do it because I love it. I love to travel. I fell in love with those kids I got to work with last year, so that’s why I really want to go back to this part of Africa. I just really loved the kids there and I’d love to help them. My pre-med studies are going pretty well right now. Organic chemistry is not easy for me, but it’s OK. My other classes are fine. I’ve been playing hockey since I was four years old. My dad was my coach. That was my first love and I’ve been doing that forever. That got me into school and pretty much filled up my life and who I am. I found this other volunteering stuff. I volunteer at High Hopes Therapeutic Riding center in Old Lyme. I got there every week once a day, usually Saturdays, for two or three hours. I lead horses around and we help mentally disabled or physically disabled children learn how to ride horses. It’s a therapeutic technique and it’s actually really, really exciting. I love doing that. I started doing that my freshman year and that really got me into volunteering. I coach younger children’s hockey camps and stuff like that in the summer and girl’s lacrosse camps. I like to do all that because I love kids and helping people. What kind of medical career do you hope for? There’s so many options. At first, I was thinking I’d like to be a pediatrician because of my experience with these kids over in Africa. That really put me toward that path. Right now I’m not really looking to settle into a practice anywhere because my primary goal is to get into med school and work with Doctors Without Borders for a few years before I actually grow up or anything. I would love to work with them and travel with them wherever they need help. I would have gone to Haiti in an instant if I were an actual doctor right now. Then maybe after I’ve had my fill of traveling around and adventure, I’ll settle down and be a pediatrician or maybe a primary care provider. Does your father approve of your going into medicine? At first, he didn’t really have much to say about it. He didn’t think that was a choice for me because you really don’t really have a life until you’re out of school, and still you’re a doctor and don’t have a life except for what you do. He wasn’t thrilled about that, but as I’ve been doing these things, he’s really come to see that this is what I want to do. He’ll bring up a topic like, are you doing these things right now and how are your grades and are you ready to do this? He’s really come around. Our entire family thinks this would be great for me, so I’m glad to have the support from them. What schools are you considering? Right now what I’m thinking is that my GPA is not exactly stellar. I’m at like a 3.0 right now because of this organic chemistry. Hopefully by the time I graduate I’ll have it up to a 3.3 or something, but medical schools want 3.5 or higher from what I’ve heard. I’m probably going to do a post-bac program. Drexel has a good program. I think you get a master’s in public health and then they ship you off right into a medical school program from there, assuming you do well on your MCATs and do well in the classes. I’ve been looking at the University of Buffalo. Their medical school is where my father went. I would like to stay closer to home, just to have that support, but I’m seven hours from home right now in Connecticut. I like that aspect of being away, too. It’s a difficult decision, but I will go anywhere I get in. I don’t really care what part of the country it’s in. I just want to be in med school. If anyone wants to get in touch with you or offers help, I’ll forward their information to you. And if you have an interest in writing something up or sending pictures, I’m sure people will want to know how you’re doing over there. First of all, I’d love the help if people would like to help. I have $10,000 in grant money so far and I’m going to be fundraising a little bit more, just to gain a little money for the orphanage itself and try and buy a lot of medications for this clinic that I’m going to be at, because other than this system, they really need the drugs to make everyone healthy again. I’m going to be doing a little bit of fundraising and a little bit of extra money would be helpful. The electronic medical records software, if anyone comes up with an idea or wants to donate something about that or a simpler version of one of these high tech ones, that would be really helpful. I’ll definitely get back to you by the end of August or the beginning of September. They actually don’t have Internet where I’m going to be and I’d have to have a lot more money to get it shipped in if I wanted Internet. I am two hours from an Internet site, so obviously my parents aren’t happy since they can’t talk to me very often, but I will be going back and forth from this town to get supplies because there’s basically nothing where I am. It’s just like a store, your orphanage, your clinic, and a whole bunch of homeless people, but I could be able to get in touch with you. If someone is inspired by your story and would like to make a difference like you have, what advice would you give them? Do what you love to do. That’s all I’ve been doing. I started out loving to travel, and then that got me out to Connecticut, and then I ended up in China, and then I ended up in Africa and fell in love with a bunch of orphans and taking care of people and volunteering. My advice is just do what you love and follow that because your potential is completely unlimited. Go for it. There are a number of free/open-source EMR/EHR packages out there. Here are a few links that may help you get started. Admirable work. Keep it simple. In the category of Yunus’ micro banks. Nobel Peace Prize. This part of the world is where EMRs may show improved outcomes and increased efficiency. In the USA, UK, Au and other countries, the costs do not justify benefits. The outcomes have not improved. Costs have not decreased. In honor of nurses week, I can categorically say that the money is being wasted on EMRs and CPOEs. It would be better spent on human resources, like better training for me and my coworkers. The patient is not a machine. You can use the OpenMRS software offline first, then upload the records when you have internet access available. I also posted a review that has more detail and perhaps Mr. H. can post it again since I had trouble searching for it. In a news environment that seems to be filled with political bickering and negativity, it is so refreshing to hear about young people like Brigid! She is a very bright light and it is people like her that will contribute much in solving today’s problems. Your parents should be proud of you! Great interview! As a SUNY Buffalo Med grad, I’m glad to see people from the Buffalo area doing great things. Wow. You are so on the right track, Brigid, not only in what you are doing, but in how you are thinking and how your heart is reacting to the world around you. I hope you stay the course, because we all learn vastly from the likes of you. Medsphere’s open source OpenVista EHR system is available free for download but perhaps a bit much for them to handle. However, a cohort of University of California, San Diego, Health IT students put together a community clinic implementation plan that is available for free download. Start here – https://medsphere.org/people/csomer/blog/2010/05/07/ucsd-contributes-plan-for-openvista-implementation-for-community-clinics – for all the pertinent links. Or see the official news release from Medsphere and UCSD about the project here – http://www.medsphere.com/news/569-san-diego-students-team-with-carlsbad-based-open-source-ehr-leader-to-plan-ehealth-records-implementation-for-community-clinic . I can put you in touch with the head of the program if you like. I hate to admit it, but my first thoughtat first was that this was going to be some sappy interview with another do-gooder of privilage. After having read the first couple of paragraphs, I couldn’t help but think that Brigid O’Gorman has a lot to teach all of us. She’s makes me proud of my alma mater, Nichols School, and have some hope for the future in a world where there is an excess of pain, suffering, and indifference. Wonderful intentions and great passion! I would encourage her to do some research before she goes. There is a lot going on in this area in Africa, particularly with OpenMRS. We chose to implement it with a common mulitlingual, multinational data dictionary in ten countries in sub-Saharan Africa. It is not just about setting something up in one clinic or hospital. It is about creating an interoperable, scalable and sustainable health information system which works with the country’s overall architecture. Otherwise, it will just be a waste of time. We don’t want to reproduce the US health information situation in Uganda ;). Check out http://www.childcount.org for how we are linking community health workers to clinics using OpenMRS and the http://www.millenniumvillages.org for the overall project. There are people on the OpenMRS listserve who would also be willing to help! For Pete’s sake, Health (you don’t mind if I call you Health, do you? ), Brigid is a college junior running a personal humanitarian project to help a village that has a single light bulb! In this case, I’d say it IS about “…setting something up in one clinic…”.